The most important problem for the upstream and downstream movement of aquatic organisms are barriers like dams, weirs or power plants. These buildings physically cut off fish from their spawning or wintering grounds located over impoundments and make it impossible for the fish to return below the impoundment. The devices used to enable fish to by-pass such impoundments are fish passes. Contemporary knowledge makes these structures better and better, adapted to the biological requirements of fish, so that they to a large extent fulfil their purpose. In some situations, in order to increase the efficiency of the fish passes, it is necessary to install additional devices to help fish find their way to fish passes. Such a device is the NEPTUN system. Installing the NEPTUN system on the lower impoundment, in the right place and at the right angle, and by blocking fish, by means of an electric field generated by the system, the possibility of coming to the dam or outlet of a hydroelectric power station, allows them to more quickly find a way to fish passes. This significantly improves its efficiency – especially when the current flowing out of fish passes is smaller than the water flow coming from e. g. a hydroelectric power station or dam. Installation of the NEPTUN system on the upper impoundment, in case there is a hydroelectric power station and in such a place where the speed of water is sufficient for fish to react to the electric field, protects them from injury or death. In addition, by selecting the appropriate angle of the system installation, we enable the fish to be directed to fish passes or other safe area. 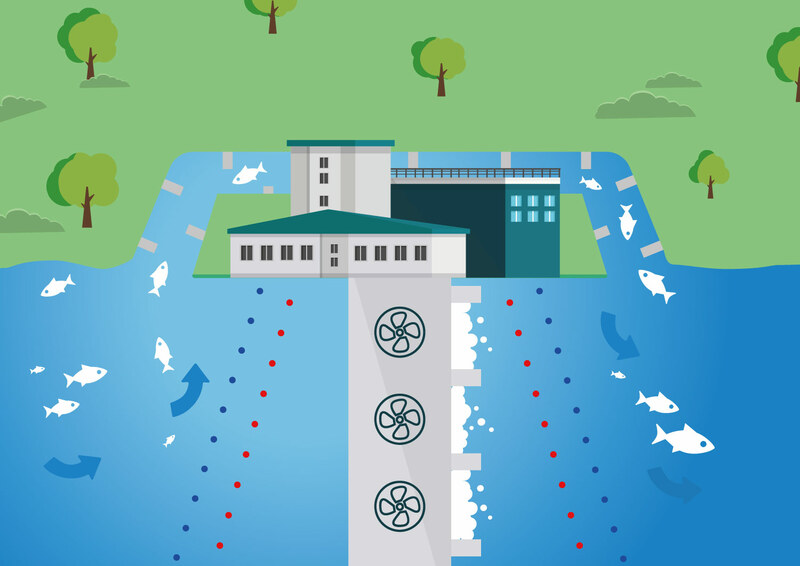 By installing the NEPTUN system on the upper impounding, we limit the possibility of fish entering the turbine inlets of hydroelectric power plants and thus damaging them. In addition, we can also direct the fish towards the fish pass and speed up the migration of the floating fish. By installing the NEPTUN system on the lower impounding, we direct the fish towards the entrance to fish passes and do not allow them to come near the outlets of a hydroelectric power station or dam.